Land Investors Mitigating Risk. There are several ways to mitigate your risk. Jack Butala: Welcome to our show today. 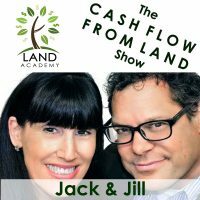 In this episode, Jill and I talk about how land investors mitigate risk. And I have to admit, I’m excited about talking about this. 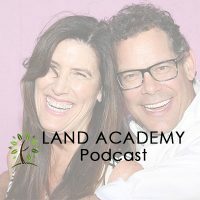 I talked about it a little bit on our weekly call-in Thursday, and decided to do a whole show on it, because I haven’t thought about it in a while but man, this is so much less risky than flipping houses. Jack Butala: Before we get into it, let’s take a question posted by one of our members on the Land Academy community website. It’s free. Jack Butala: I can tell you, I found out what this is the hard way. Jack Butala: Don’t, don’t, don’t do it. Jill DeWit: Great, do you really want one third of that property? Jack Butala: Quite some time ago, somebody in California got the bright idea to assign APNs, assessor’s parcel numbers, to individual owners of fractional ownership. Like if Jill and I went and bought a piece of property, 40 acre property, it would get two APNs. Jack Butala: You can predict what’s going to happen. It turned out to be a massive mess. One person passes away, what happens? We don’t know. Jack Butala: It said, to rectify it now, title companies and attorneys, they rectified it by different ways to take title. Jill DeWit: Right. Tenants in common. Jill DeWit: Dictates what’s going to happen. Jack Butala: Yeah, that’s right, and that’s the right way to do it. I have percentile letters, like all of us, offers over the years, and incorrectly sent them to fractional ownership. It’s hard itself, you’re looking at a list of APNs, which ones are and which ones aren’t. Jack Butala: And accidentally bought a fractional, you know, closed the deal. And you don’t want to do that. Jill DeWit: Don’t want to do that. Jack Butala: Because it’s just impossible to track the other person down. Maybe they passed away, their heirs are wherever. It’s a mess. It can be a mess. Jill DeWit: I still see it, by the way. Jack Butala: The only way to rectify is quiet settling it. Jill DeWit: Yeah, well I would say, we still have one or two that we just said we’re not going to worry about it. We just let it go. And I still see the taxings coming through where it shows our company name with this other guy’s name on it. Jack Butala: This is from like eight years ago. Jill DeWit: Ivan something, and I’m like, ‘This is hilarious. Like we’re ever going to do anything with it.’ We don’t even know who this Ivan guy is. Jack Butala: I know exactly which one you’re talking about. Jill DeWit: We’ll never see him. I hope he uses the property, because we’re not. Jack Butala: That being said, think with me here. You can buy this thing, buy this fractional ownership. Maybe you get it for next to nothing, 100 bucks for 40 acre property, let’s say. This is not inconceivable, because no one wants to touch it, you’re the only person, and then you quiet title the heck out of the thing, because you become an expert in that, or you find an expert in the area, an attorney, and quiet title it to all the other owners, and now you own a 40 acre property for 100 bucks plus quiet title fees. Could it backfire? Could somebody read the newspaper like it’s 1948, where you have to post it from the statute standpoint and say, “Oh my gosh, that is my property.”? What are the chances of that? Jill DeWit: And me, I’m going to describe it a little differently, meaning that you’re the one that’s showing up and starting to pay the tax bills and so you’re taking responsibility for the property with the county. You have to post it that, ‘Hey, I’m showing up here, I’m doing it and I want to quiet title it all to my name. I don’t know where these people are.’ There’s legal ways you have to reach out and try to find the other owners to get them involved. That’s what Jack’s saying. If you did that, there’s things that have to go in the paper, and notices have to be sent. Jack Butala: It’s a literal court case. Jack Butala: It’s literally filing a lawsuit. Jill DeWit: Then eventually they say, “Nobody else came forward. We did A, B, C, D, and E. Since nobody came forward, which maybe it’s one other person, then you officially are now the sole owner. That’s a process. Jack Butala: I’ve quiet titled property, and I’ve had properties quiet titled against me. It’s no big deal. Jack Butala: You just follow the rules. You have to be super, super Johnny-on-the-spot. There are timeframe requirements, and if it says 30 days, they don’t mean 31, they mean 30. Jack Butala: But once you do one, you get it under your belt, and the laws are all different all over the country. And it’s not called quiet title, it’s called adverse possession. That’s the concept, and then that’s the Roman numeral one, and then quiet title is one of the ways to do that. Jill DeWit: Exactly. Good question though, Ryan. Thank you. I know. Ryan only asked the time, he didn’t ask how to build a watch. Jack Butala: How a watch works? Jack Butala: Thank you for making this show interesting. Jill DeWit: You’re welcome, you’re welcome. Thank you. Here to help. Jack Butala: You watched models change their clothes? Jack Butala: I forgot what this show was about already. Jack Butala: That’s what happens with … Jack without Jill dot com. Jack Butala: Do you have a question? Do you want to reach out to either one of us? Check it out on landacademy.com. 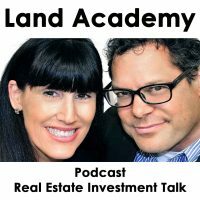 So today’s show is all about how land investors mitigate risk. That’s the short version of the title. 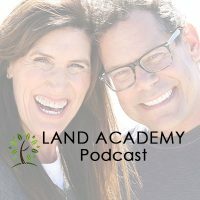 The long version is: “It makes so much more sense to invest in land, as a land investor, versus houses.” There’s so many things that can go wrong with a house. Especially if you mortgage it, it’s a financed deal. Think about it for a second. You’re buying a piece of land. If it burns down, it’s not going to be any less valuable. In fact, sometimes burning all the stuff off of it makes it more valuable. Jill DeWit: Exactly, just cleared away all that debris. Jill DeWit: “My washing machine, oh my washing machine doesn’t work.” “Um, you know, I don’t know, someone slipped in the pool.” There’s so many things. They’re just not paying their bills. They’re not paying the rent. That’s a big one. Jack Butala: Not pay the rent. You gotta evict them. Jill DeWit: Yeah. Roof leak, bring it. There’s all kinds of things that could go wrong that you have to take care of. Jack Butala: That are out of your control. In a land deal, in my opinion, you have control. If something really goes sideways in a land, it’s probably because you paid too much, and you have control over how much you pay. If something goes sideways in a house deal, or an apartment deal, and you financed it, it could be because it rained. It rained hard for two weeks. That’s not your fault, and you have no control over that. If it rains hard for two weeks on this piece of dirt, that you own, that’s good. Jill DeWit: You know what the thing is, too? I don’t have to go out and see it, I don’t have to babysit it. That’s a big thing for me. For what we do with land, I’m buying and selling land all over the country. Jack Butala: There you go, there’s a long list of … You don’t ever have to ever go look at it. Jill DeWit: Number one. It doesn’t matter where I am, and it doesn’t matter where the property is. It’s all about the numbers, and it’s great because we have so many people in our world that are in other countries that are buying and selling land here, too. So you don’t even be in the United States, nor do you have to be a citizen. It just takes all that out of it. Gosh, so there’s no risk with the property, like you said. No risks about where I am. I don’t have to see it, do something to it. What are your other-? Jack Butala: It’s really easy, when you look at the back end of an assessor’s database, like we do, that’s how we send mailers out to owners, to assess. Once you know it’s vacant, which is where- not vacant, once you know there’s nothing improved on it, there’s not a house on it, or roads, it’s very, very simple to value it right out of the assessor’s database, in my opinion, and then consequently easy to send offers to owners that work. Houses, without looking at the physical asset, which none of us have time to do, it’s very difficult to really value it. Jack Butala: If it’s in a master plan community, or it’s got some sales comparisons around it, you can kind of guess, and we do buy a lot of houses that way. But nothing beats a good piece of land that nobody wants anymore, from a money standpoint. It’s virtually risk-free. If it’s got drive-up access and you’re buying a property that’s less than 50, maybe 20 to 40% of what they really sell for, how can you lose? Jill DeWit: Exactly. I got one, I got another one. One of the ways we mitigate risk is we pay cash. Jack Butala: Yeah, no financing. Jill DeWit: There’s no financing. It doesn’t’ matter to me if it sells tomorrow, or a week from tomorrow, or a month from tomorrow. I’m not worried about it. I’m not paying mortgage. The banks not looking for me. Jack Butala: Taxes are real cheap. Jill DeWit: I’m not trying to flip it real quick, and then there’s a delay, and I’m losing money because of that. Yeah, and the taxes are a lot cheaper. I seriously, at the end of the day, no matter what asset you’re buying, even it’s a residence, ’cause that’s the way we roll, too, is … God, when you pay cash for it, it’s so nice. You sleep so well at night knowing that it’s paid for. Jack Butala: Well it’s an asset on your balance sheet, on the right side of the balance sheet. The correct side, is what I mean. Jill DeWit: Correct side. Not the right side. Jack Butala: Left side of the balance sheet, and a little bit on the bottom right. That’s the accounting coming out. Jill DeWit: Left, bottom right. Jack Butala: There’s nothing in the upper left-hand corner. All you accountants out there are snickering. Jill DeWit: And I have no idea what he’s talking about. There we- and Jill’s out. Jack Butala: Assets, liabilities, equity. Assets minus liabilities equal equity. Jill DeWit: Ah, got it. Okay, got it. Jack Butala: On a cost basis, here’s the kicker, you have to record it on a cost basis. If you bought a 40 acre property for four grand, but it’s worth 22, how do you account for it then? You just jump up and down. It doesn’t matter. Jack Butala: Because you don’t report to anyone, ’cause it’s your land, and your career. Jill DeWit: There is that, that’s true. Jack Butala: There is no structure. Jill DeWit: That’s true. The last thing you want to do is call the assessor and say, “Hey, by the way, did you know it’s worth this and you only priced it at that?” Don’t do that. Jack Butala: We had a member do that recently. Do you call the IRS, too? Jill DeWit: You say, “By the way, you missed something. You forgot, my father-in-law just gave me $100 thousand dollars. You didn’t catch that.” No. All right, you want to do the right thing, but let’s not be silly. Jack Butala: That was Monday’s show. If you don’t take your time and really learn how to do this right, and expect to just- you’re going to splatter a million offers out. Splatter the whole world with offers that are silly. They’re $5 and $15 and $48. Yeah, you’re going to waste a lot of money on mailing to upset a lot of people, so you don’t want to do that. Jack Butala: Buy the assets properly. Jill DeWit: Overpaid for property. Jack Butala: Just ’cause they wanted to do a deal so bad? Jill DeWit: They just didn’t know what they were doing. Jack Butala: You know what? I’m going to say this sentence: Never, ever buy a piece of property, I don’t care if it’s land, or an apartment building, or anything in between, house, for more money than the cheapest property in the market that’s available. Jack Butala: If you go to a website, Zillow, Trulia, LandWatch, Land and Farm, or our site, Land Pin. Any of them. And you’re buying a five acre property like Cathleen disclosed yesterday, for 22 hundred bucks, you’re buying five acres, and there’s 10 of them posted there for 23 or $2400, don’t do the deal. Or go back and say, “I only can pay 1500.” And it’s the same thing with houses, you do not ever. Whoever bought property incorrectly that you’re referring to, they could’ve rectified that in five seconds. Jill DeWit: They just didn’t know. I know. They didn’t know, they overpaid. And then I bring it to them and point it out, they go, “Yeah, that’s why that guy was jumping up and down.” Yeah, that’s why he was jumping up and down. Jack Butala: Yeah, that’s another indicator. Jill DeWit: If your seller says, “Hot-damn”, as they hang up the phone or something like that, you might be overpaying. No. Jack Butala: If you walk into a dealership and do a deal, and everyone is jumping up and down except you, that’s not good. Jack Butala: Nevermind. I was going to throw in some snarky humor about getting a date, but not good. Jill DeWit: Thank you, thanks for saving that. I appreciate that. Jack Butala: If you have a question or you want to be on the- Oops, sorry, let me turn the page. Jill DeWit: and inspiration, that’s me, to get just about anything you want. Jack Butala: We use it every day to buy property for half of what it’s worth, and sell it immediately. Jill DeWit: You are not alone in your desire to buy assets risk free ambition. Jack Butala: Good show, Jill, good work. Jill DeWit: Friday. Thank you. Thank you very much. It’s Friday. Jack Butala: I like this video thing, I guess. Jill DeWit: I think this could be really good. I’m anxious just to see how this all comes out. Jill DeWit: That’d be fun. Jack Butala: And try to get a boat. Let’s charter a boat. Jack Butala: Do ’em out there. Jill DeWit: We can just join on the whale watching tour that we watch go out. That’d be hilarious. Jack Butala: Oh my God, we should get two tickets to the whale watching show. Jill DeWit: [crosstalk 00:15:51] and walk around with this on. Jill DeWit: Wouldn’t that be fun? Jack Butala: A shuttle to Catalina. Jill DeWit: And do it from Catalina. Jack Butala: Or just do it on the shuttle. Jill DeWit: That too. It’s a long ride. Jack Butala: I know. It’s bumpy. Jill DeWit: It’s a long ride. Well, today’s a good day. Jack Butala: I wonder if we could get a water taxi from here to Marina Del Rey. Jill DeWit: Sure we could. Jack Butala: We should do it on- Oh my God, [crosstalk 00:16:16]. Jill DeWit: Done. Lots of ideas.